A few weeks ago I shared my experience when I grounded my sailboat while navigating Lake Okeechobee. It is currently in long-term storage at a marina while I wait for God to provide the resources needed to repair the rudder. It excites me to see God at work in my life and relationship with him through this experience. I shared on social media the work God has done in my life in my understanding of stewardship versus ownership. It is truly a place of rest when I keep my focus where it should stay. If you read only those blogs, you might think I always respond the way I should. Nothing is further from the truth. In the following days I found myself struggling to keep my focus on God and not on my circumstances. Most of the time I kept my focus on him. But there were quiet moments when I was alone, far from the spotlight of ministry, and I wrestled with my lack of faith. One of my favorite verses is Psalm 103:14, “For he knows our frame; he remembers that we are dust.” This deeply ministers to me in the moments when I feel all too human. God created me from dust, and to dust someday I will return. In the moments between, I am dusty. I am of this world. I am human. My heart does not always respond the way my head knows it should. It is okay. God knows how he made me. He remembers I am dust. Throughout Scripture we meet many interesting characters who carried the dust of the world on their journey. Peter is one of my favorites. He is bold, outspoken, quick to action, and undeniably human. Following the miraculous feeding of the five thousand, Jesus sent the disciples on ahead of him to the other side of the Sea of Galilee. Jesus stayed behind to dismiss the crowds, and when all had departed, he found a place where he could pray in solitude. In the coolness of the evening he was alone. By this time the disciples were far from shore. A storm had risen, and they labored against the wind and the waves. After many hours, the disciples had only managed to traverse two-thirds of the way across the lake. Darkness consumed the vessel. The tempest beat upon them. They were weary. Their arms ached from rowing. In the waning darkness, the disciples saw the figure of a man walking on the sea. Terror gripped their hearts. “It is a ghost!” they cried. Here is where my brash friend Peter makes me smile. He blurted out, “Lord, if it is you, command me to come to you on the water.” Be careful what you ask! For Jesus says to him, “Come.” And, in one of the most understated moments in Scripture, it says, “So Peter got out of the boat and walked on the water and came to Jesus” (Matthew 14:28, ESV). Now we could stop our story right here, and Peter’s actions would impress all of us. Just as you might think more highly of me than you ought after reading the blog of my response to the grounding of the vessel. But let us continue our tale, for this is where it gets interesting. My friend, we are all human. We are dusty. We do not always respond the way we know we should. Sometimes the wind and waves overwhelm us. In those moments, even though we fail to trust him fully, God understands. He still rescues. He still leads us to a place of rest. He still loves. When Peter and Jesus return to the other disciples in the boat, the seas stopped churning. The wind died down. Rest settled upon the weary. And everyone in the boat, including Peter, worshiped Jesus saying, “Truly you are the Son of God.” Their focus returned to Jesus. They worshiped. They understood a little more who he was. 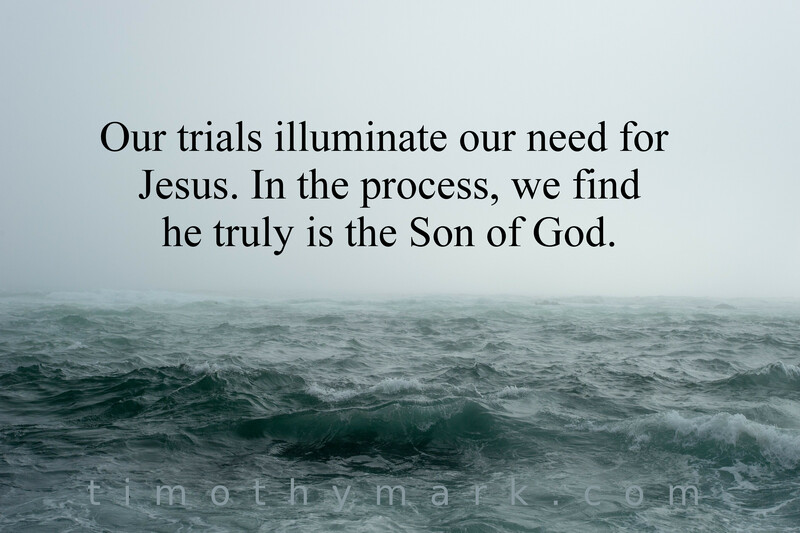 Our trials illuminate our need of Jesus. In the process we find he truly is the Son of God. Our God is a God of grace. May we use each trial to trust him more fully. May God increase our faith. May we grow in our relationship with him. May the moments of doubt and confusion decrease, and our moments of trust increase. Sometimes we walk on water. Sometimes we sink beneath it. May each moment draw us closer to him. I enjoy reading your thoughts. Please write your comments below. I have an odd question for you. It is one that has been haunting me lately. It can be summed up in one tiny little word, but the ramifications are huge. 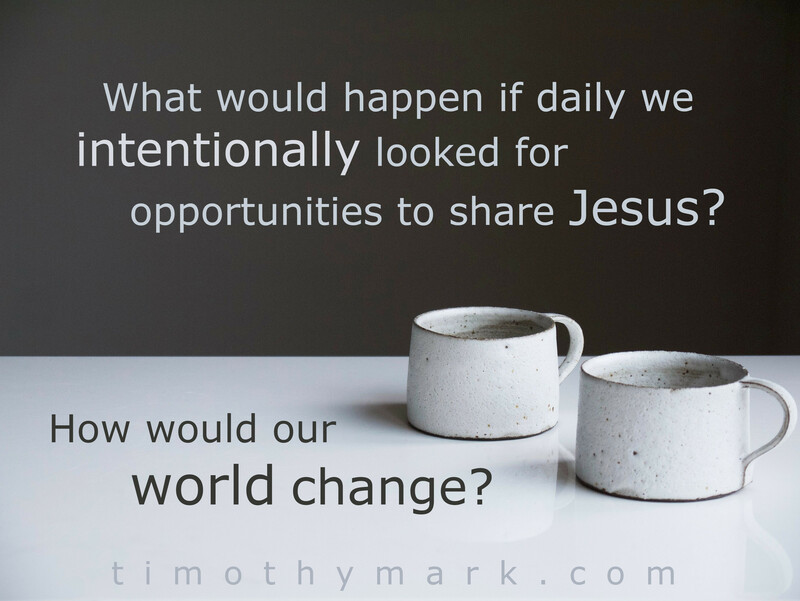 My question is, “Why?” It affects every aspect of following Christ. For example, why do you share your faith? Why do you give? Why do you attend church? Why do you teach Sunday School? Why do you lead worship? Why do you sin? What is your “Why”? Recently I was at a fast food restaurant getting an evening meal. Earlier in the day I had been working on clearing out the garage, and I was worn out. I slid into a seat in the corner of the dining room and set my tray of food on the table. As I ate, I quietly looked around the room. The restaurant was empty except for one other customer. One of the employees was wiping down the tables. As she wiped the table next to me, I told her how much I appreciated her service to me that evening. It was a simple thing to do, and her face lit up when I spoke to her. She thanked me for noticing. I did notice her. I had been watching her as she worked. Her face looked tired, and her gray hair suggested she was old enough to be my mother. I wondered what had happened in her world that had led her to get this job at this time in her life. As I watched her work, I felt something stir inside me, a longing I couldn’t quite put my finger on. I looked over at the other customer a few tables across from me. From the corner of my eye, I watched him as he ate, and again, something stirred inside me. I felt compassion for him, even though I didn’t know him. I wondered if he had any relationship with God. I wondered if he knew that God loved him. I watched the workers at the counter going about their jobs, and again, a melancholy emotion stirred inside me. By this point I was starting to wonder what was going on with me. Why was I feeling these emotions when I looked at these folks? I took a sip of my drink and pondered the question for a moment. For some reason, I loved these people even though I didn’t even know them. I cared about their situations. I cared about the events in their lives that led them to this moment. Those feelings were still bothering me as I left the restaurant and turned left onto the road back to my home. As I drove in the darkness, I couldn’t shake the feelings I had felt in that dining room. It occurred to me that for some reason, I just loved those people. I wondered if they had any relationship with God. I wondered if they knew that God created them so that they could know him personally. I realized that I saw them differently because I loved them. Then I thought about my life and ministry, and this is where the simple question began to mess with my mind. Why do I preach? Do I preach because I like the way it feels to be in the flow of the Holy Spirit? Or do I preach because I love people so much that I have to preach, because if I don’t preach they may not understand that God loves them and wants to have a relationship with them? Can you see the subtle difference between the two answers? One response is motivated by how it makes me feel, the other is motivated by how I already feel toward others. I am reminded of a verse in the Bible. It is likely the first verse you ever learned as a child. It says this, “For God so loved the world, that he gave his only Son, that whoever believes in him should not perish but have eternal life” (John 3:16, ESV). Tucked away in this short verse is the answer to the “Why” question. The reason God gave his son for us was because he loves us. God’s love for his creation was so great that he was willing to give up the life of his own son for our benefit. The “Why” was love, and it changed everything. Now think back to the questions I posed in the opening paragraph. Why do you share your faith? Do you do it because you think that is what a good Christian is supposed to do? Do you share your faith only as part of a visitation program at your church? Or do you share your faith because you love people so much, and you realize that if you don’t share with them, they may never know that God loves them and wants a relationship with them? Why do you give? Do you give because you think that is what a good Christian is supposed to do? Do you hope people will notice your generosity? Or do you give because you love people so much that you want to share with them all that God has given to you? Why do you attend church? Do you attend church because you think that is what a good Christian is supposed to do? Or do you attend church because you love the body of Christ, and you can’t wait to be able to spend time with those you love? Why do you teach Sunday School? Do you teach Sunday School because no one else would volunteer, and you felt obligated to do it? Or do you teach because you love those kids so much, and you want them to understand how much God loves them as well? Why do you lead worship? Do you lead worship because you like to be seen or heard? Do you want people to hear how great you can sing? Or do you lead worship because you love God with all your heart, and you want others to experience his presence in their lives as well? Why do you sin? Is it because you love your sin more than you love God? The reason the “why” matters is that it checks our motives. Our service should be motivated by our love. Whenever we serve, but we do not love, we are not really very godly after all. To be godly is to be like God. Remember, God loved the world, and then he gave his son. I’m considering those around me in a new way now. I’m seeing people differently. I’m looking at them through a lens of love. I see past their imperfections, and I see a man or woman whom God created and loved. I love them too, and I’ll do whatever it takes for them to know God. Why? Because I love them. I smiled. That simple act of love had stopped him in his tracks. For me, it was a simple act of gratitude born out of love. I genuinely appreciated his service to me, and because I loved him, I wanted him to know it. I’ve said it before, and I will say it again: everything changes when you love someone. So, my friend, what is your “Why”? This article was originally published in the June 2015 Newsletter. It doesn’t seem possible, but this month marks the completion of 25 years of itinerant ministry. I am dumbfounded when I consider all that God has done. A lot has changed in the past 25 years, and as I look ahead, I can see God changing things again. But as I look back, one thing has been consistent. God has been faithful. He has been faithful to meet all of my needs and the needs of the ministry as I have learned to follow him by faith. It is his faithfulness and kindness that I rely upon. Most recently God provided in a very dramatic way. In September, I wrote about how a sense of weariness has crept into my life over the past couple of years. I’ve grown weary of being on the road, schlepping through airports, waiting in line at rental car counters, checking in and out of hotels, and staying in homes, all while traveling to churches and ministries across five continents. At the same time, the ministry has faced some significant challenges behind the scenes. With the problems in the US economy beginning in 2008, the total number of ministry events I do each year has decreased. During this same period, donations to the ministry have fallen sharply as well. At times I wondered if God were redirecting me somehow. Perhaps it was time to close down the ministry. I looked at a variety of other options but felt no leading from God. The weariness continued to grow. At some point early this year, I considered taking some time off from travel to focus on the writing side of the ministry. I had started a new book last year but it was only partially completed. The idea of a sabbatical made sense. I could take some time off to focus on finishing the book. But while the time off the road was attractive, I also had to consider the consequences of no ministry events for six months. How would my financial needs be met if there were no income from live events? I considered renting out my house. I looked at a lot of other options. I put off making a decision because I just didn’t know what to do. Finally, this past August I was able to take a week of vacation with friends. During that time I rested deeply. I didn’t do any work on my laptop, no email, and no ministry events for 7 days. It was so refreshing. But on Friday of that week I started to feel a sense of melancholy setting in. By Saturday, the day I was supposed to fly home, I was depressed. I did not want to go back to my reality at home. I realized at that time that I needed a break from the road and needed to make a decision one way or the other regarding the sabbatical. I wanted to wait until the end of October to make the decision because then I would have a better idea of where I stood financially. I could look at the money in the bank and make my decision based on whether the funds were available or not. But God doesn’t work that way with me. Instead, he clearly said to me “No, Tim, you make that decision based on whether or not you feel I am leading you to do that and then you trust me for the finances.” And so at the end of August I took some time to fast and pray about the sabbatical. It was important to me to know that God was leading me to do this because I have never closed the calendar in twenty five years of ministry. It was a significant decision for me. Very quickly into the fast I could tell God was leading me to do this. Once I had a clear word from God, I went online and cleared the calendar on the website. It was official. I would take a 6-month writing-sabbatical beginning in mid-November following my last scheduled ministry event for the year. At the time I made the decision, there was only enough money in the bank to cover the expenses for 2 months. I had no idea how we would make it. What happened next was stunning. In twenty five years of ministry, I have never seen anything like it. Within 30 days of my making the decision to take the sabbatical, God provided all of the funds needed to cover our operating expenses for the entire sabbatical! And it wasn’t with one large donation. It was many small donations from individuals moved by the Holy Spirit to give. I can’t explain it except to say that God has shown his faithfulness in a remarkable way. It was an incredible encouragement to me personally. When God provided financially in the dramatic way that he did, it was as if he were putting an exclamation point behind his name “Faithful!”. He was clearly telling me, “I have you in the palm of my hand.” The confirmation that he was indeed leading me to take the writing-sabbatical was significant. It gave me incredible confidence to move forward with the writing of the book. I share this with you to remind you of the faithfulness of God. I also want you to have an idea of what I see God doing behind the scenes and to ask you to pray for me during this time. I value your prayer support. I believe the Holy Spirit will guide you into how you can best pray. I have been praying that God would give me influence over all of North America. I am passionate to see the church in North America returning to God. I believe the book will challenge many folks to love God with utter abandon and to love others selflessly. I continue to believe that if we would just do those two things, everything would change. Our lives would change. Our churches would change. Our world would change. All for the better. This past week, I read one of David’s psalms and it ministered to me deeply. It is Psalm 103. I encourage you to read the entire Psalm. But let me share just a few verses with you that spoke to me personally. “The LORD is merciful and gracious, slow to anger and abounding in steadfast love. He will not always chide, nor will he keep his anger forever. He does not deal with us according to our sins, nor repay us according to our iniquities. For as high as the heavens are above the earth, so great is his steadfast love toward those who fear him; as far as the east is from the west, so far does he remove our transgressions from us. As a father shows compassion to his children, so the LORD shows compassion to those who fear him. For he knows our frame; he remembers that we are dust” (Psalm 103:8-14, ESV). Now you may think this is an odd passage to share when I have been writing about the faithfulness of God. But what jumped out at me is the line “he remembers that we are dust.” I am not God. I do not think like God. I cannot make my life work apart from God. But he is kind. He is faithful. He remembers that I was created out of the dust of the earth. He is okay with my just being Tim and his being God. He knows when I am weary. He knows when I need to crawl up into his lap to be held by him, and in his faithfulness he provides a way for me to do that. I need a God like that. Today, I don’t know what is going on in your world. Perhaps you need to be reminded that God is faithful. He does not treat us as we deserve. Instead, he gives us grace, mercy, forgiveness, and love. He knows what is going on in your life. He is aware. He faithfully takes care of his own when we rely upon him. His name is Faithful! I don’t know what the next 25 years of the ministry will look like. I don’t know what God has planned to achieve through the writing of the new book. I do know that whatever lies ahead, God will be faithful, and that is enough for me. I’m content to follow him one day at a time, to love him, and to love others out of the overflow of his love and faithfulness to me. This article was originally published in the November 2013 Newsletter.